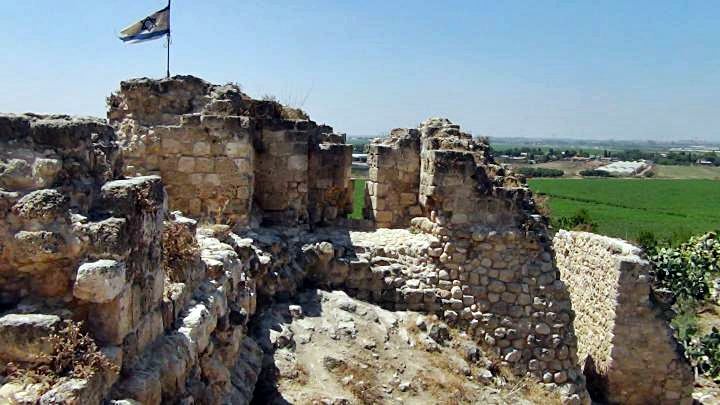 Remains of a Crusader and Mamluke period fortress, located on a hill at the side of ancient roads. 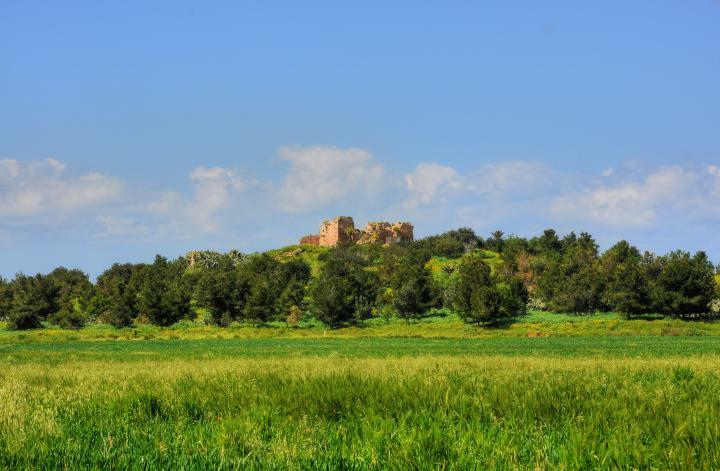 A national park with remains of a Crusader and Mamluke period fortress and a mosque, located on a hill above the eastern side of the valley of Hefer. The site was located near major ancient roads, and used to protect and offer services to the travelers along these roads. 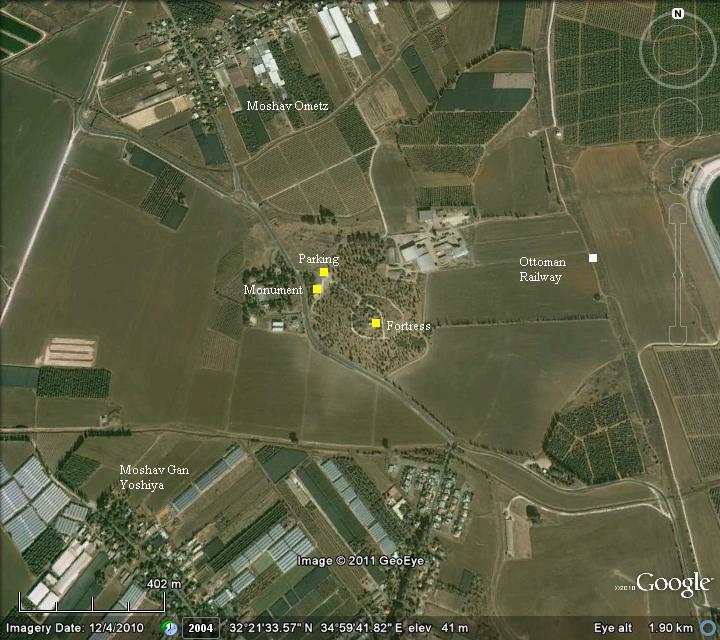 The following aerial view shows the points of interest around the site. 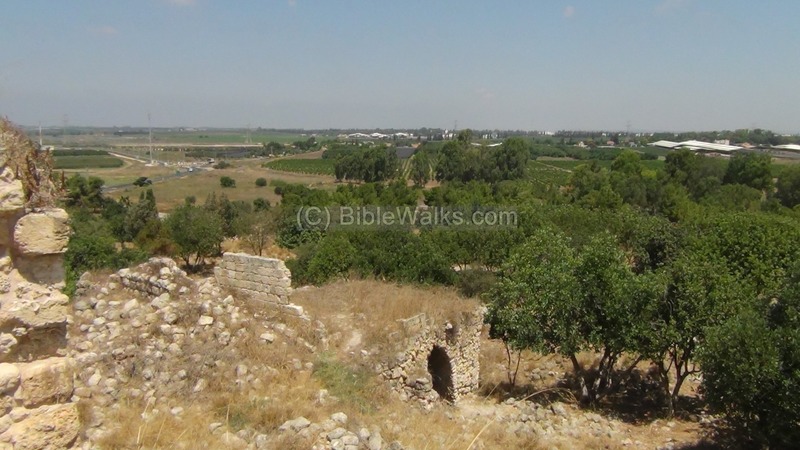 It is located in the valley of Hefer (a section of the plain of Sharon), between Moshav Ometz and Moshav Gan-Yoshiya. You can point on the yellow squares in order to navigate to the selected point. The site was first inhabited during the early Bronze age period (3150-2200 BC). Burchard of Mount Sion (a 13th century German Dominican who traveled to the Holy Land) identified the site with Michmethah, a city in the possession of Ephraim (Joshua 16: 6): "And the border went out toward the sea to Michmethah on the north side; and the border went about eastward unto Taanathshiloh, and passed by it on the east to Janohah". Another verse relates the city to the tribe of Manasseh (Joshua 17:7): "And the coast of Manasseh was from Asher to Michmethah, that lieth before Shechem; and the border went along on the right hand unto the inhabitants of Entappuah". This place was also visited by the traveler Benjamin of Tudela in 1160, who identified it with Biblical Keilah (although that site is now identified in a site south of the valley of Elah). A Biblical map shows the area around Tel Qaqun during this period. Qaqun is strategically located near the north-south Via Maris, the ancient road that connected the regions north of Israel (Mesopotamia, Asia minor and Syria), via the Megiddo pass, to the center of Israel and the south (Egypt). 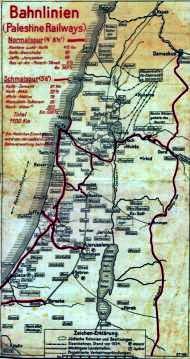 Another route connected Via Maris to Samaria and Shechem in the east. Qaqun is marked below as a red square, west of the Biblical city of Socoh (of Samaria). Socoh is mentioned in the Bible (1 Kings 4:10): "The son of Hesed, in Aruboth; to him pertained Sochoh, and all the land of Hepher". The land of Hepher is the area around Qaqun. The Assyrians, the new rising empire, expanded their territory to the east. Shalmaneser III was the Assyrian king who invaded to Israel in the first Assyrian intrusion (841BC). His forces reached the Galilee and Horan, destroying several cities such as Hazor. However, the Assyrians had to focus on wars in other regions of their empire, and left the area. In 734 the Assyrians first conquered the coast of Israel, reaching Gaza and the border of Egypt. This time they bypassed the Northern Kingdom. In 732 BC was an intrusion to the North of Israel by the Assyrian King Tiglath-Pileser III, who annexed the area (as per 2 Kings 15: 29): "In the days of Pekah king of Israel came Tiglathpileser king of Assyria, and took ... Galilee...and carried them captive to Assyria". During this period the area of Qaqun was spared, but the kingdom was reduced to a small size, and had to pay high taxes to the Assyrians. 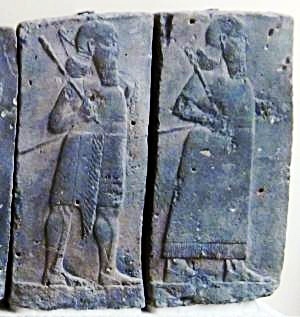 The Egyptians, enemies of the Assyrians, encouraged the people in the occupied territories of the Assyrians to revolt following the death of Tiglath-Pileser. Hoshea, King of Northern Israel, joined this mutiny, but made a fatal mistake. This time the Assyrians crushed the remaining territories of the Northern Kingdom. The intrusions of Shalmaneser V and Sargon II in 724-712 crushed the Northern Kingdom and its capital city (2 Kings 17: 5-6): "Then the king of Assyria came up throughout all the land, and went up to Samaria, and besieged it three years. In the ninth year of Hoshea the king of Assyria took Samaria, and carried Israel away into Assyria, and placed them in Halah and in Habor by the river of Gozan, and in the cities of the Medes". 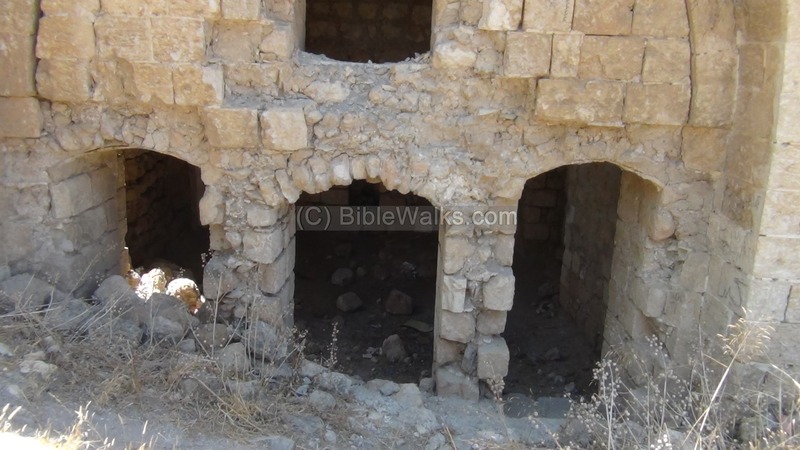 This site was captured and destroyed by the Assyrians. Assyrian artifacts were discovered here, including fragments of a stele of Sargon II which lists the cities he captured. 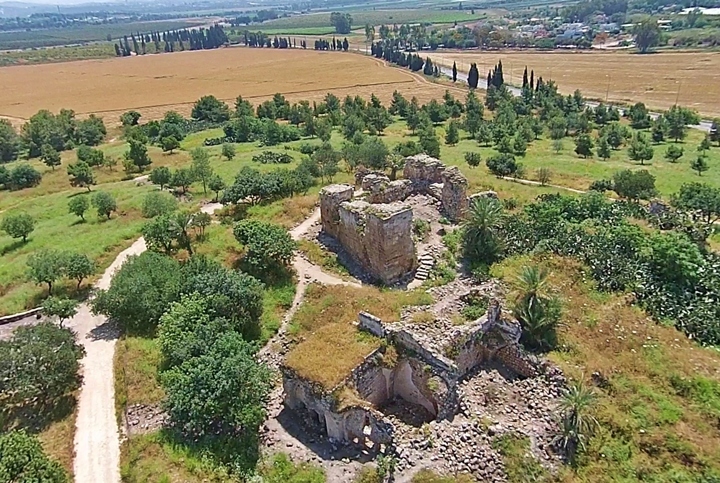 The site was later inhabited during the Roman/Byzantine period (63 BC-324 AD, 324 AD-638 AD). Few remains were found from that time. Tel Qaqun is at a strategic location - on the side of the Roman road from Neapolis (Shechem, Nablus) to Caesarea. 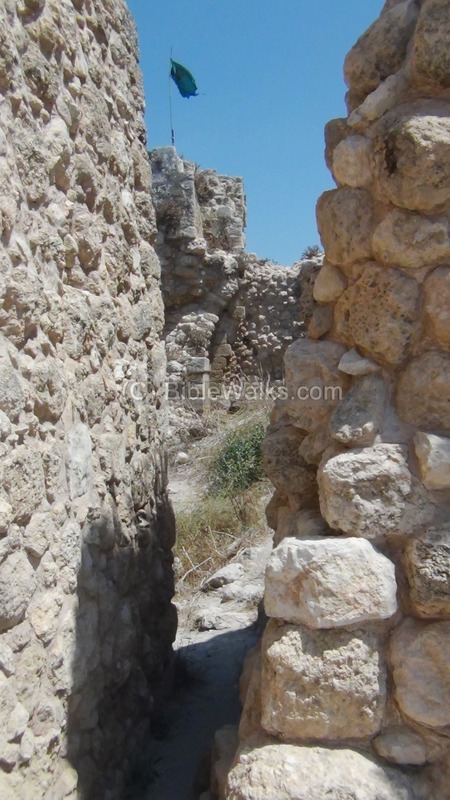 This ancient road passes through Wady esh Shair (Shechem stream, which flows into the Alexander stream), and continues to Jerusalem. 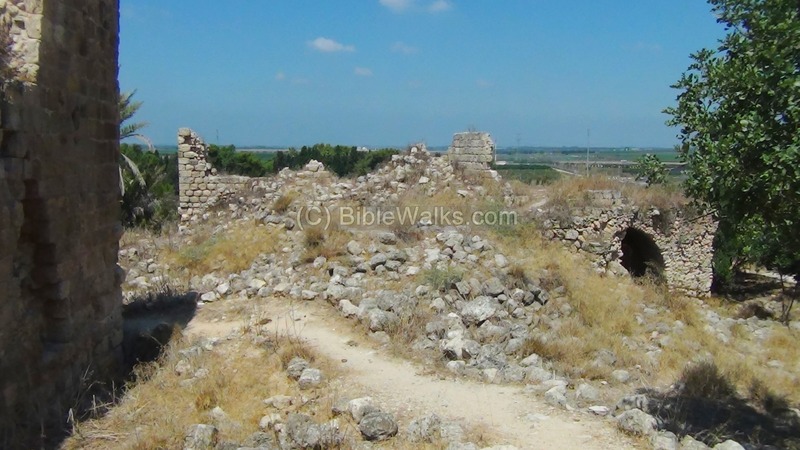 Another Roman road connected Caesarea and Legio (Megiddo) to the south (passing through Luddis-Lydia). The Peutinger Map (Tabula Peutingeriana) is a medieval map which was based on a 4th century Roman military road map. The map shows the major roads, with indication of the cities, and geographic highlights (lakes, rivers, mountains, seas). Along the links are stations and distance in Roman miles (about 1.5KM per mile). The roads are shown as brown lines between the cities and stations. In the section shown below is the area of Jerusalem, drawn in a rotated direction (Egypt on the left, the Mediterranean sea on the top). Jerusalem is illustrated in the center as a double house icon, which represents a major city. It is listed as "formerly called Jerusalem, now called Aelia Capitolina" (antea dicta Hierusalem n(unc) Helya Capitolina). The section where the Roman road passes through Qaqun is indicated as a red square, close to Caesarea ("Cesaria"). 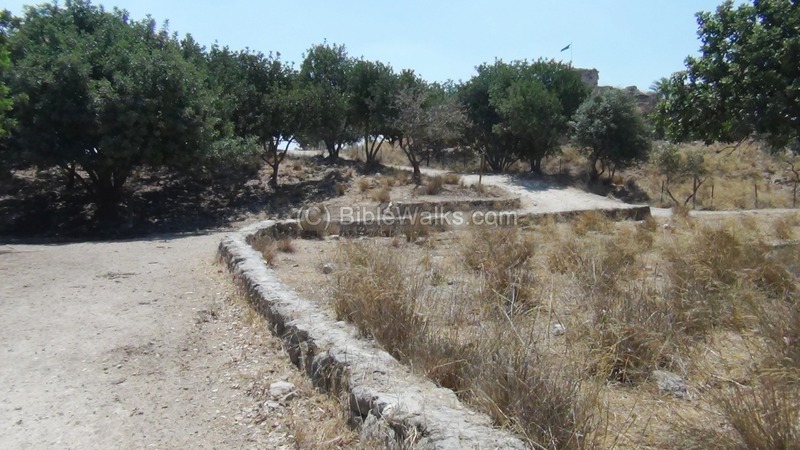 This Roman road, from Caesarea to Nepolis (Shechem - marked with a double-house icon), is XXXI (31) Roman miles, or 46 KM. Another road to the south continues to Luddis (Lydia), shown as another brown line. 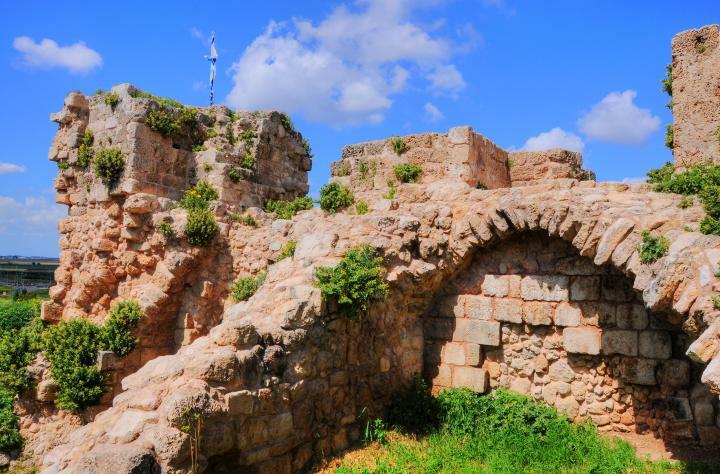 The Crusaders (1099-1291 AD) protected their pilgrimage route from Acre to Jerusalem with a series of forts and police stations. This site, named by the Crusaders as "Caco" (or "Chaco", "Caccho") was one of these fortresses. The fortress was built in the beginning of the 12th C. It was first mentioned in Crusaders texts in 1123. Since it was a gateway along the main north-south road, the fortress had a strategic military importance. This important minor town also served the caravans, supplying water shelter and food. Caco was inhabited by Syrian Christians, Frankish Knights and other settlers. 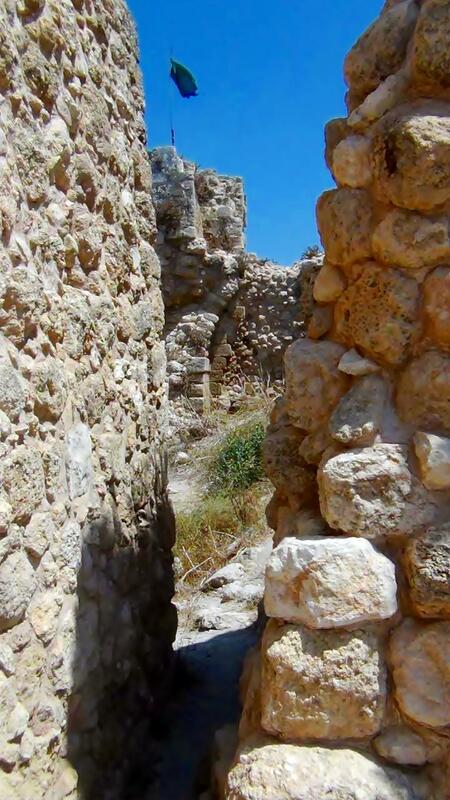 The Crusaders town was controlled by the Crusaders lords of Caesarea. These knights were of the Templar order, a military-religious organization which was established in 1118, naming their organization after the temple: the guards of the temple. Their task, as defined by the pope, was to protect the pilgrims and patients that visited the Holy Land. The knights of the Hospitallers also held property in Caco. The order, officially established in 1113, named their order after John the Baptist, and were called the "Knights Hospitallers of St. John", or commonly known as the Hospitallers. 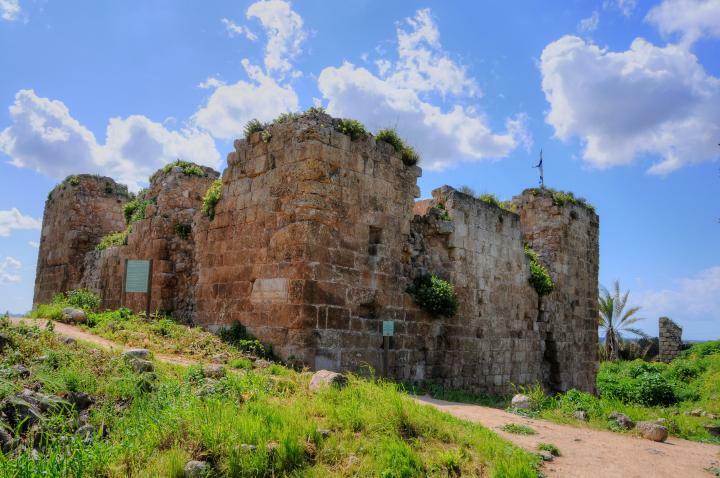 Another Crusader castle (Castrum Rubrum) is located 5km southwest in the ruins of Khirbet Burgata. 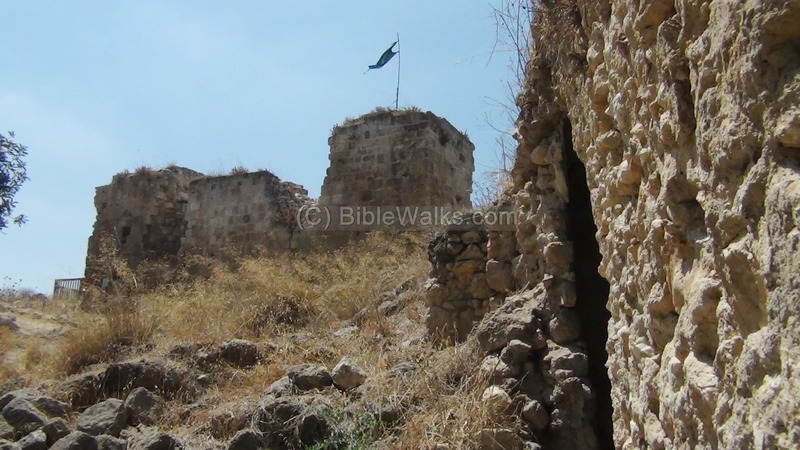 This castle is known as the the "red-tower" (al-Burj al-Ahmar). 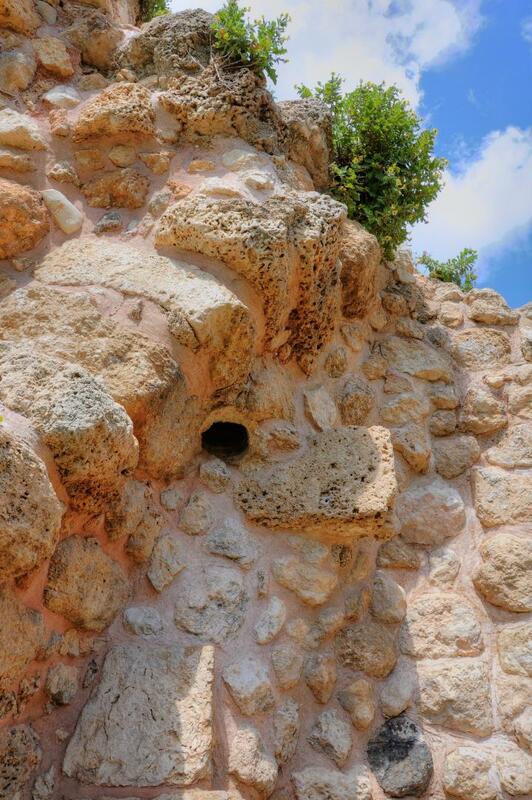 The castle has a similar design as in Caco, but only its south wall has survived. The Mamlukes took Caco in 1265, and rebuilt the castle a year later. The Mamlukes converted the Latin Parish Church into a mosque, and established a Khan (inn) to support their postal road from Cairo to Damascus. 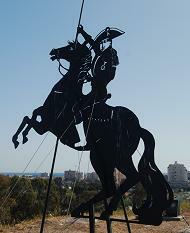 The Crusaders tried to regain Caco in November 1271, but were defeated by the Mamluke leader Bybars. The Crusaders finally departed from the Holy Land in 1291, thus ending 266 years of their Kingdom. Since the Mamlukes were inferior in the sea and feared another Crusaders attack from the ports along the shore, they destroyed all the port cities. This shifted the focus of the trade route from the shore (through the ruined Caesarea) to the inland route that passed through Caco, thus increasing its importance. 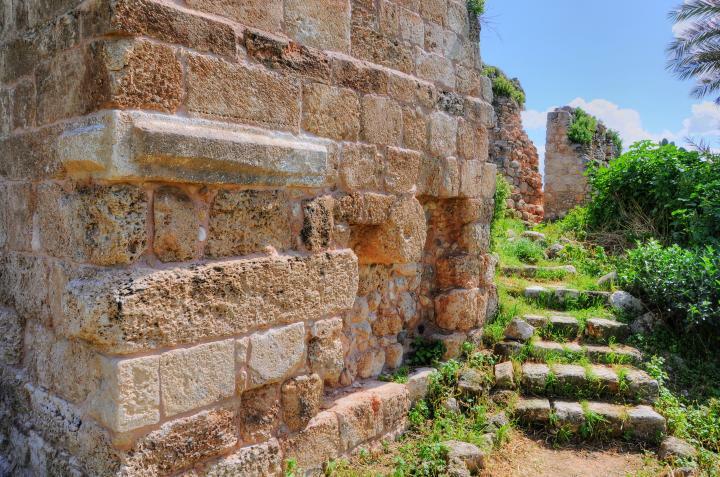 Bybars also moved the administrative center from Caesarea to Caco. The village at Caco (now Qaqun) provided road services, and became major station along their most important link - the Cairo-Damascus route - and a road to Nablus (Shechem). 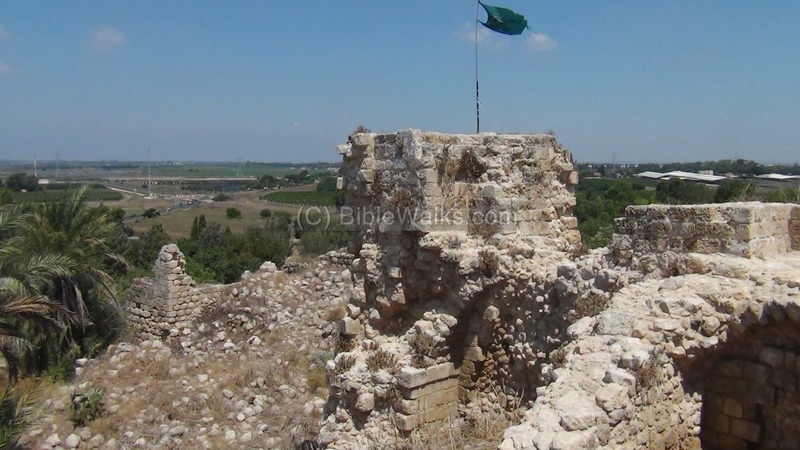 The Mamlukes used it as a fortress, a watch tower (to alert on a possible return of the Crusaders), a center for a district, and a post station. The Mamlukes controlled the Holy Land until the Ottoman period (1516). In March 15, 1799, Napoleon fought against the Ottoman forces in what is known as the battle of Qaqun. The Ottoman forces, headed by Ahmed Al-Jazzar, attempted to block the forces of Napoleon at Qaqun after the French captured Jaffa a week earlier. The French forces attacked the Ottoman army from Qalansawe, a town south of Qaqun. They managed to defeat the enemy, but sustained high casualties. 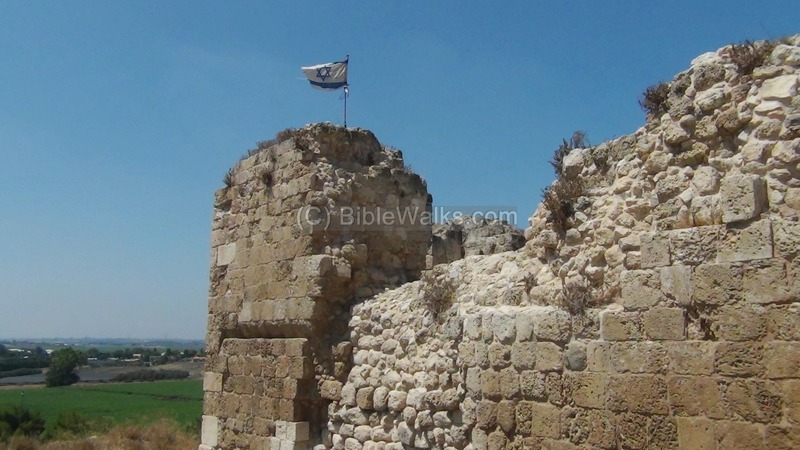 This victory opened the way to the Galilee and the beginning of the siege of Acre 4 days later. In 1834 the Arabs of Palestine reacted to a new military draft policy and reformation changes, and revolted against the Egyptian rulers headed by Muhammad Ali, the reformer and founder of modern Egypt. In order to quell the uprising, the Egyptian Governor Ibrahim Pasha (son of Muhammad Ali) razed Qaqun, as well as other villages and cities. He later replaced its residents with Egyptian farmers and nearby villagers, who built stone and mud houses around the fortress. The village was examined in the Palestine Exploration Foundation (PEF) survey (1866-1877) by Wilson, Conder and Kitchener. The site appears on this map of 1878 in its Arabic form - "Kakon". Several roads pass through the village, including the north-south road which was once the major ancient road connecting the north to the south. "Kakon- A large village, which is, however, quite modern, having been built up by a mixed population coming from the hill villages, round the fine central tower, which is ancient. The place is very conspicuous, though the ground to the north is rather higher. The houses are of stone and mud, the water supply from wells ; the neighborhood round is arable land. ... Marino Sanuto shows it on his map under the title Caconanatat, and in his text gives it as Kakon-el-Anatah". "In the middle of the town is a square tower of small masonry. One or two stones are drafted ; some of the arches arc pointed ; the mortar is white, and laid thick ; the masonry is of soft limestone, the walls 15 feet thick. A staircase leads up to the roof. The place resembles generally the tower of Kiilunsaweh ; it is about 60 feet square, and between 40 and 50 feet high". Visited 22nd March, 1873. "The small castle whose ruins are still standing at Kakon is mentioned by several Crusading chronicles. Burchard ... says that the castle was erected by the Saracens, 'contra Castrum Peregrinorum.' Ricold (thirteenth century) mentions it as a castle 20 miles from Athlit. Marino Sanuto calls it Caco-Manatat. ". The Ottomans attempted to conquer the Suez canal from the British during WW1 (1914-1918). 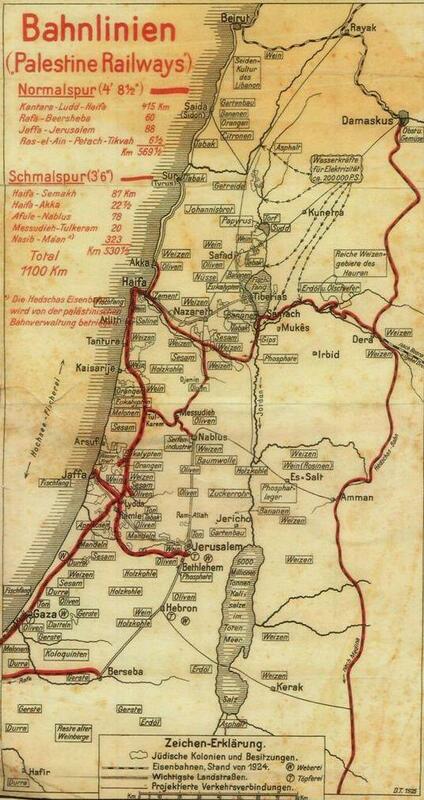 They supported this mission by laying out an extension to the western Hejaz railway section from Damascus to Medina (Arabia) and to Afula, which was built in the years 1900-1908. The design and management of the entire Hejaz railway project was commissioned to the German engineer Heinrich August Meisner. This railway was extended to Beer-Sheba in 1915 and reached Nitzana and Be'erotayim in 1916, then was completed in Kuseima (Biblical Atzmon, 10km west of Kadesh). The Ottoman railway passed on the east side of the village. Although the rails are long gone, you can still see the path of the Ottoman railway near Qaqun. Another eastern branch of the Ottoman railway split nearby towards Nablus, passing through Wady esh-Shair (Shechem stream). Qaqun was one of the largest villages in the Sharon area. During the Arab revolt in the 1930s many Arab residents of the large village of Qaqan participated in sabotage of the railway and other properties. British and Jewish forces operated in the village to apprehend the terrorists. During the Independence war Qaqun was an Arab base of the Iraqi forces who invaded Israel in order to crush the newly founded country. On June 5, 1948, the Israeli Army managed to capture the village and destroy it. 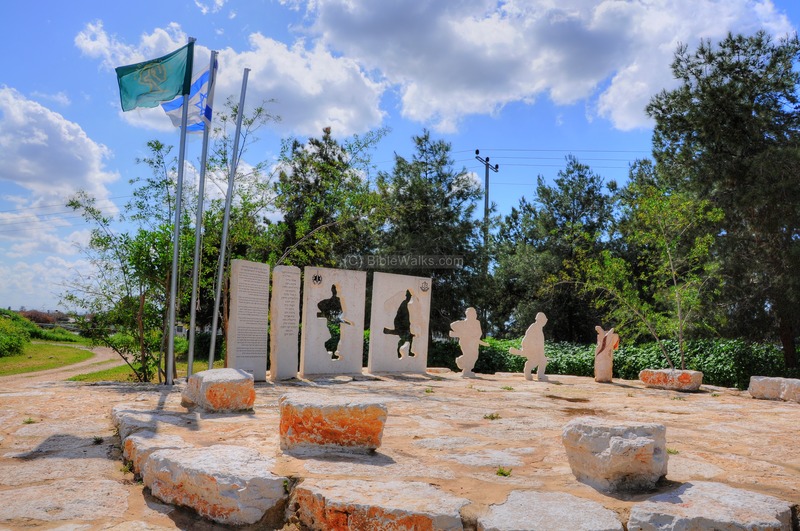 A memorial is located on the west side of the fortress, honoring the Israeli casualties. The visible remains of the site were surveyed in 1983 by Denys Pringle of the School of Archaeology in Jerusalem [BSAJ]. Today the ancient site is part of a small National park, and open free to the public. An IAA conservation project in 2007 cleaned the site and partially reconstructed the ruins. You can walk by the remains of the mosque and climb into the fortress, enjoying the views of Emeq-Hefer (valley of Hefer). A drone captured this view from the north east side. A path leads up to the entrance on the south east side of the castle. The parking area is seen here on the far right side. 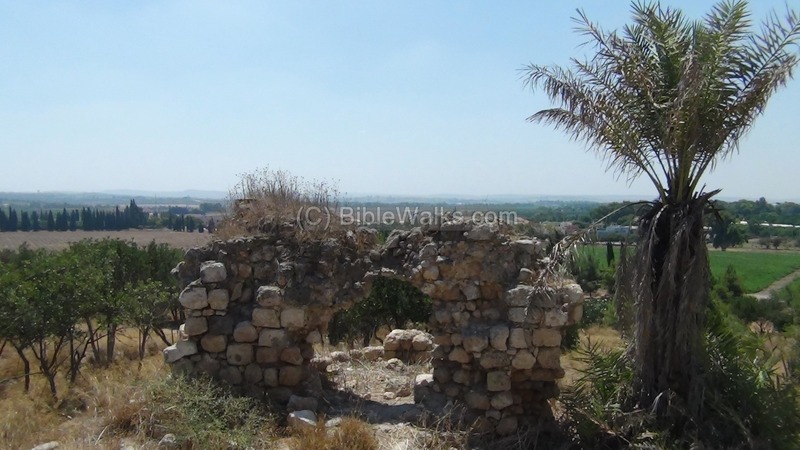 In the background is Moshav Ometz. Another view from the north west side is shown in the next photo. In the right side of the background is Moshav Gan Yoshiya. 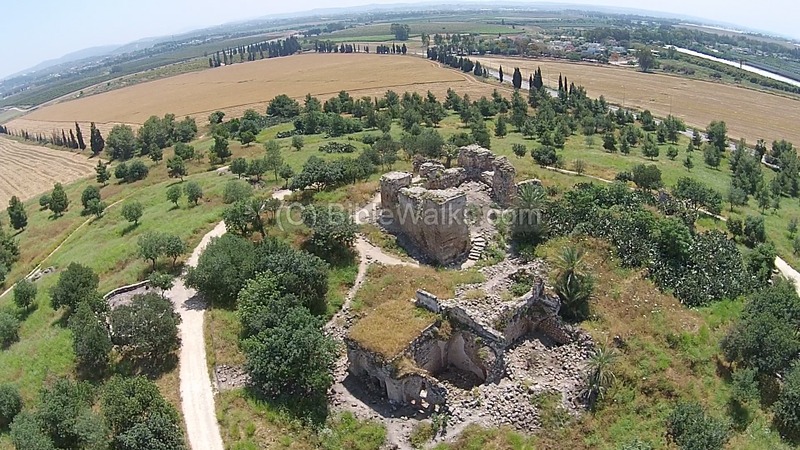 The Youtube video was also captured by the drone from the north west side, crossing the Donjon then turning around. 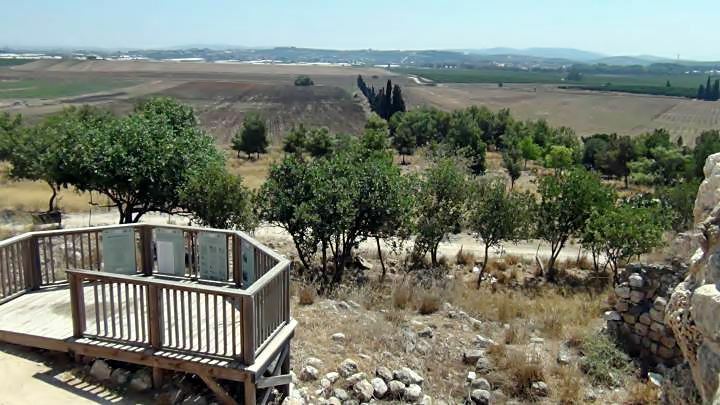 The photo below shows a ground view from the south-east towards Tel Kakun. 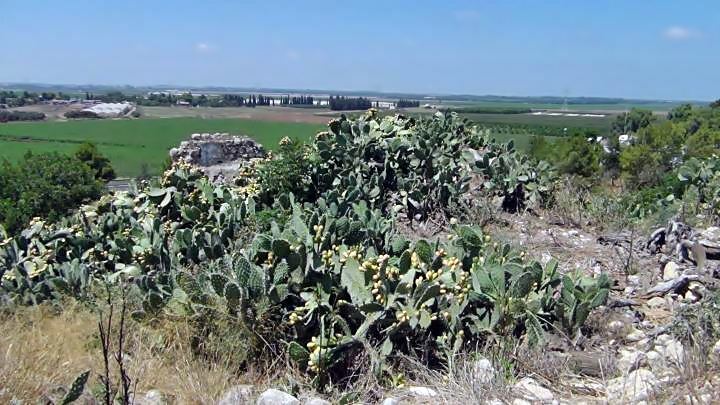 On top of the hill, 52m above sea level and 25m above the fields around it, are the remains of a 14th C Mamluke period fortress, which was based on the 12th C Crusader fort. 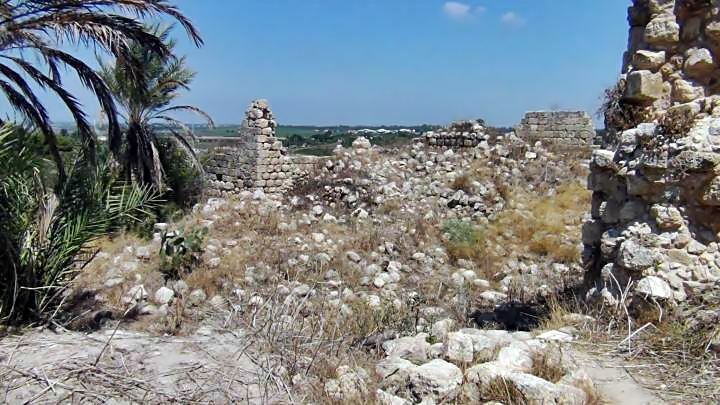 Around the hill are ruins of a large Arab village, which was leveled in 1948. From the parking lot on the northwest side of the hill is the entrance to the National Park of Qaqun. The Crusaders donjon (inner castle), located on the top of the hill, was built in the early 12th century. It is a rectangular shape (17.6m x 14.4m), fairly low (8.5m high) and stone vaulted throughout. The Mamlukes reconstructed the fortress in the 14th C, and dug a wet moat around it. 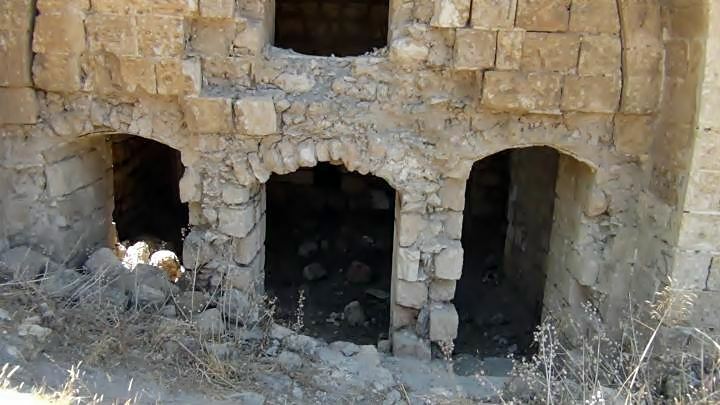 The fortress in Qaqun may have been protected within an external enclosure, which is not seen today. 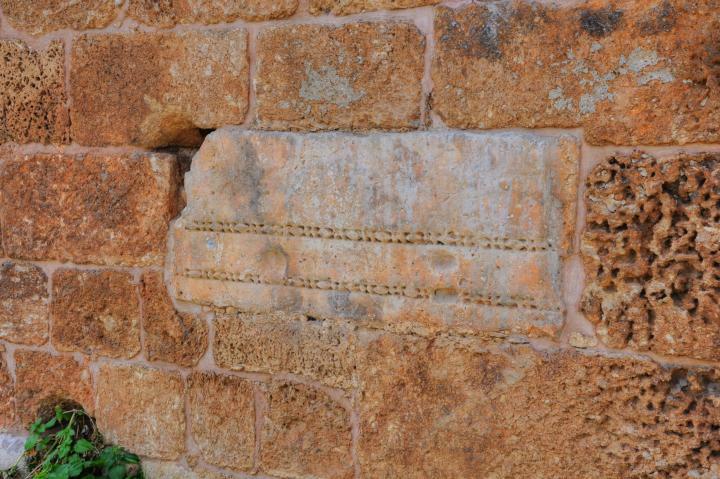 As seen on the eastern wall, the builders of the castle reused Roman/Byzantine stones, such as marble coffins, columns and milestones. The entrance to the Donjon was through an opening on the south side. A stairway along the wall led to the upper floor. Note that the Donjon (French) is also called "the keep" (English), which is a strong central tower which is used either as a tower, inner fortress or dungeon (hence the name Donjon). In medieval castles the Donjon was usually an inner tower which protected the defenders in case the main walls were penetrated, and in daily life it served as the residence of the commander of the fortress. 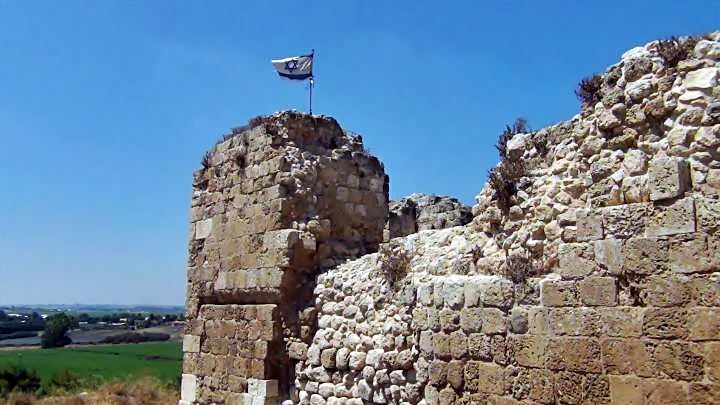 The south-east corner of the donjon is seen here, with the Israeli flag on top. 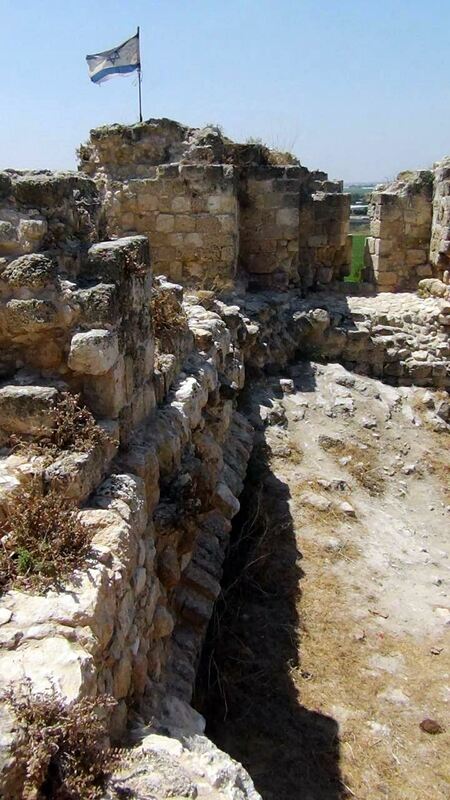 The Crusaders used fine masonry squared blocks to build the walls. A view of the south-east corner of the fortress is in the next picture. One of the arrow slits is seen on the right side. From the fortress are great views of the fields around the site. Moshav Gan Yoshiya (established 1949) is seen on the right background. The north-east corner of the fortress is shown in the following photo. The next photo is a view inside the north-east corner is seen below, with vaults on the lower floor of the tower. 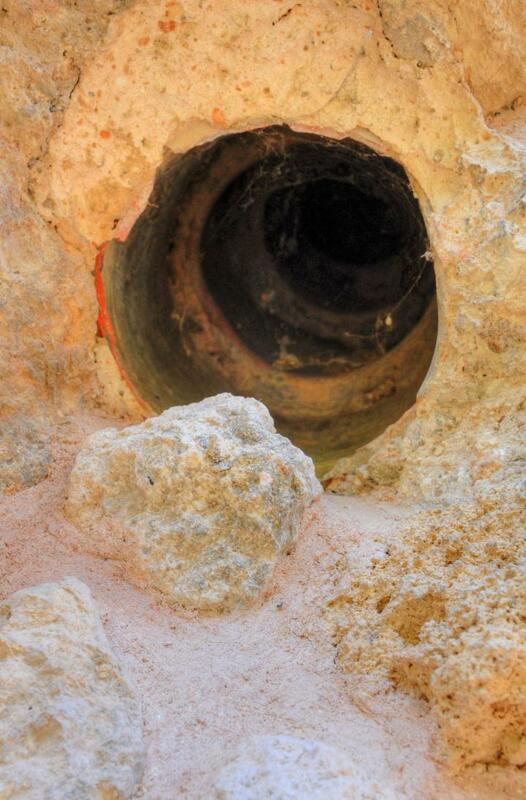 A ceramic pipe embedded in the northern wall was used for internal communications in the fortress. The photo shows the view of the north corner of the donjon. Notice the white corner stone, which is a Crusader type design. Another structure is located to the west of the tower. This may have been the mosque (which was built over the Crusaders' Latin parish church). A north view of the structure is shown in the next picture. Two large vaults supported a second floor. 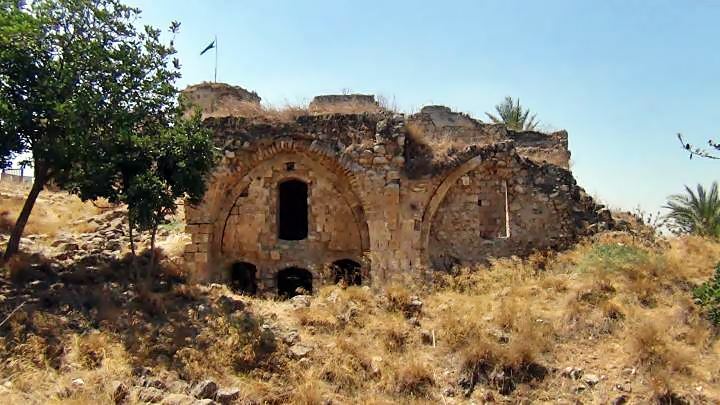 During the Israeli Independence war (June 5, 1948) the Israeli forces, soldiers of the Haganah's Alexandroni unit, attacked the Iraqi forces inside the large village of Qaqun. After a long battle the village was captured. During this battle 16 Israeli soldiers have died, and a monument on the west side of the hill commemorates the fallen soldiers. Caco, Cacho, Caccho. Caque, Quaquo - the Crusaders' name of the fortress. Qaqun - Arabic name - unknown meaning, based on the Crusader name Caco.